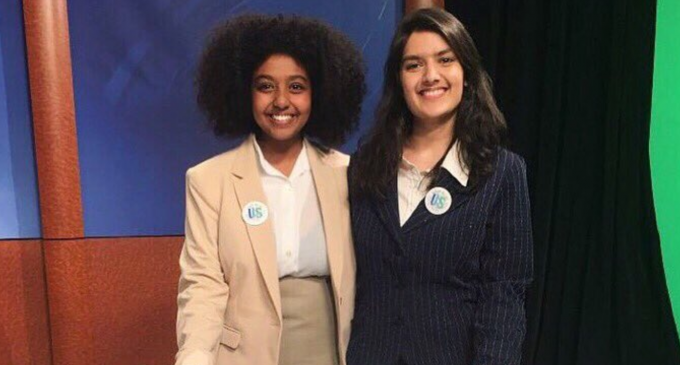 Yolian Ogbu and Hillary Shah will be the next UNT Student Government Association president and vice president after winning 58 percent of the vote. The pair won against opposing candidates and SGA Senators Kennedy Montgomery and Khalil Anthony. In this year’s election, 1,265 students voted, which equates to 3.6 percent of the undergraduate student population. That number is a decrease from last spring’s election in which 1,897 students — 5 percent of the undergraduate population — voted. This follows the downward trend seen in the last few years as the 2017 election had 2,809 votes cast and the election in 2016 had 3,320 votes. Ogbu and Shah ran on a platform of #ReflectUs, with four key points: equity and campus climate, interpersonal violence prevention, student investment and community engagement. Their platform points laid out policy ideas that included things such as gender inclusive housing, a $15 minimum wage and more lighting on campus. Shah wrote her own message via Twitter, talking about the campaign and the future. Montgomery and Anthony received 40 percent of the votes cast. Following the results announcement, Montgomery thanked his supporters and congratulated the winning ticket via Twitter. In the announcement, SGA noted that the original vote count for the Ogbu/Shah ticket was 754, which was 62 percent of the vote. To reflect the Election Board’s April 12 decision regarding their campaign tabling without authorization, 60 votes were removed from their total. Additionally, the original vote count for the Montgomery/Anthony ticket was 435, which was 40 percent of the vote. One vote was removed from their total to reflect the Election Board’s April 11 decision. Due to invalid write-ins, the totals did not add up to 100 percent of the votes cast and instead reflect 98 percent. The announcement on SGA’s website also cites complaints that were formally submitted against the two campaigns. One solicitation violation was found to be valid against the Montgomery/Anthony ticket, resulting in the removal of one vote. Ogbu and Shah will enter the offices of president and vice president with little SGA experience. Ogbu has served as the SGA Advocate General since fall 2018 and Shah has no prior experience in SGA. However, they have said they see their lack of experience as an advantage to connecting with students. One issue Ogbu and Shah will have to address following their election is the recent SGA Supreme Court decision in which the court ruled that one person from the winning ticket must be present in the SGA office on campus at the start of the term — June 1 — to conduct office hours. Both Ogbu and Shah each have summer internships at the United Nations Headquarters and the American Civil Liberties Union, respectively. “They will represent the Student Body well and place your values above everything else,” Skinner said. Also on the ballot was a referendum question, which passed by 94 percent or 1,126 votes. It asked students if they authorize “the Officers of the Senate to call a special session by a two-thirds (2/3) majority vote.” Previously, only the SGA president could call a special session. Senatorial election results were also revealed, with the most senators being elected to the College of Liberal Arts and Social Sciences at 12. The CLASS senate results were delayed due to a revote that occurred on April 11 and 12 due to one senatorial candidate being accidentally left off the original ballot. Due to the mistake, all votes for CLASS senate candidates from before April 11 and 12 were invalid. The College of Engineering had the second-most new senators elected at four, who will hold four of the five seats the College of Engineering has available. Featured Image: President-elect Yolian Ogbu and Vice President-elect Hillary Shah. Courtesy @YolianHillary Campaign Twitter. Editor’s Note: An original version of this story stated that Yolian Ogbu would be the first president of the SGA who is a black woman. However, the Daily later learned that was not true. The story has been updated to reflect this. The Daily regrets this error. Sean Riedel is currently the News Editor at the North Texas Daily, and previously served as a staff writer from June 2017 to May 2018. Please let the national election turn out exactly like this!